Obama: Options Open For Response To Militant Gains In Iraq : The Two-Way Al-Qaida-linked fighters have taken Mosul and Tikrit, while Kurdish fighters have seized Kirkuk. President Obama says he hasn't ruled out any options for a U.S. response. ISIS militants at al-Sharqat base north of Tikrit, Iraq. The al-Qaida-linked group has captured Mosul as well as Tikrit. This image came from a video posted by IraqiRevolution, a group that supports ISIS. The violence in Iraq has intensified today, with al-Qaida-linked Sunni militants moving into areas close to Baghdad after capturing the cities of Mosul and Tikrit. NPR's Alice Fordham told Morning Edition that fighters from the Islamic State of Iraq and Syria, a group so extreme that al-Qaida disowned it, are entrenched in Mosul, one of Iraq's largest cities, and Tikrit, the hometown of former President Saddam Hussein. They also have a presence in Samarra, close to the capital, Baghdad, Alice says. U.S. contractors in Iraq are being relocated by their companies due to security concerns, Reuters says. Meanwhile, President Obama said today that he is not ruling out any options for a response to extremists' advance, although the White House later clarified that "boots on the ground" was not under consideration. Secretary of State John Kerry said the president is prepared "to take key decisions in short order" concerning Iraq. "We are deeply concerned about what is happening in Iraq," Kerry said at the State Department. "We are not concerned and waiting. We are providing assistance and are in direct touch with Prime Minister Maliki" and other leaders, he said. Amid this chaos, there's a new report that the U.S. rebuffed Iraqi requests last month to conduct airstrikes against the advancing militants, and that Kurdish fighters have taken territory in the oil-rich city of Kirkuk, a flashpoint for ethnic divisions in Iraq. The BBC reports that ISIS militants "want to avoid tangling with Iraqi Kurds — a more cohesive fighting force." Kurds, Arabs and Turkmen each claim Kirkuk as their own. Iraq's Parliament is discussing the declaration of a state of emergency, while Prime Minister Nouri al-Maliki is dispatching special forces to Tikrit. Al-Maliki has also said that he'll bolster the armed forces with volunteers, which, Alice says, "many people worry means Shiite informal militias, which could deepen this sectarian problem." "But Mosul? I doubt he can take that back at the moment," she says. 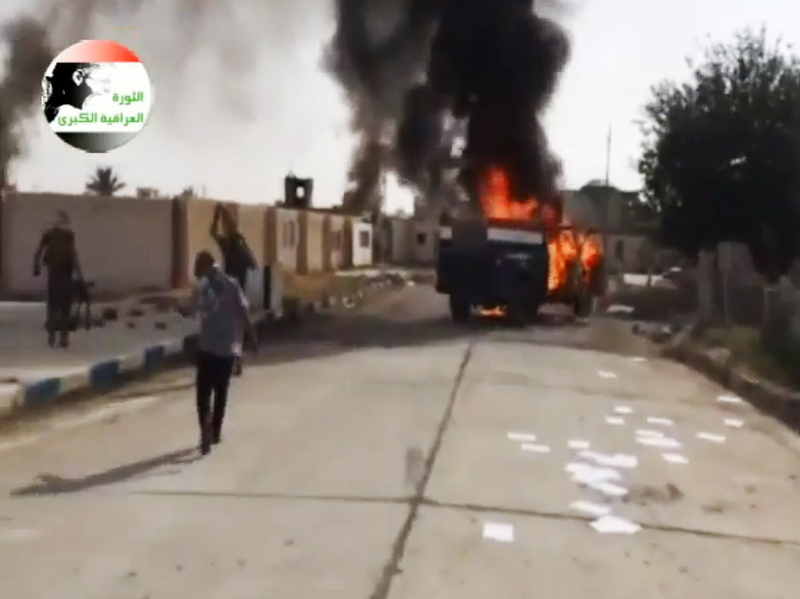 The violence in Iraq raises the specter of long-simmering ethnic tensions among Shiites, Sunnis and Kurds. Under Saddam's rule, the Sunni minority controlled much of the state. Now, the tables have turned, and it's the Shiites who dominate. The cities that have fallen to ISIS are all Sunni-dominated, and there was little resistance to the takeovers. "That doesn't mean people welcomed these militants who have really extreme views on Islamic law," Alice says. "But it might mean there wasn't enough local opposition to put up a fight." Ever since Saddam's ouster, Sunnis have mounted protests against the state, saying under Maliki they are discriminated against, tortured and imprisoned unfairly. "So in some ways the ground is set of alternative leadership to take over in these places," Alice says. The fighting has also created a humanitarian crisis. As we've reported, an estimated 500,000 people have fled Mosul since the fighting began Saturday — and the fighting is just beginning. "The Obama administration has carried out drone strikes against militants in Yemen and Pakistan, where it fears terrorists have been hatching plans to attack the United States. But despite the fact that Sunni militants have been making steady advances and may be carving out new havens from which they could carry out attacks against the West, administration spokesmen have insisted that the United States is not actively considering using warplanes or armed drones to strike them." But President Obama told reporters Thursday that he's looking at all options. "I don't rule out anything," he said. The president said it was clear that Iraq needed more help from the U.S. and the international community, adding militants must not be allowed to gain a foothold in the country or in neighboring Syria. Later, White House press secretary Jay Carney clarified that the U.S. is not contemplating sending ground troops to Iraq and that the president was referring to not ruling out the possibility of airstrikes. Obama's comments came as House Speaker John Boehner, R-Ohio, accused the president of "taking a nap" while Iraqi cities were falling to militants.